The asarabacca is an evergreen perennial; the handsome leaves persist on the plant over winter, and are kidney-shaped and leathery. 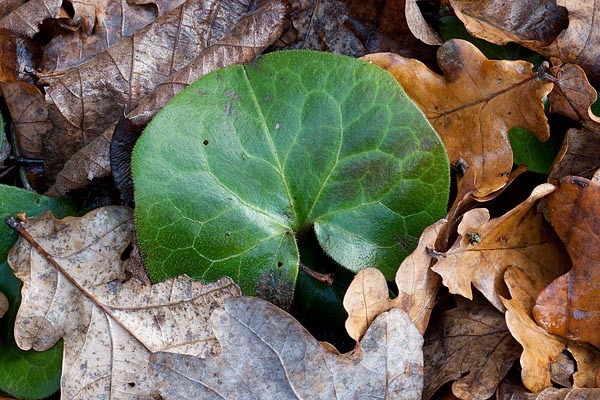 The liverwort (Hepatica) that often shares the same habitats, is similar. Asarabacca can be found in broad-leaf forests and young mixed forests, always where the soil is moist and rich in humus. A quite common plant in nature, less often seen in North Estonia, not found on our islands. Although it has its Estonian name, metspipar, “forest pepper”, from the peppery smell and the bitter and spicy taste it cannot be used as a spice because of its toxicity. The peppery scent can easily be sensed if any part is rubbed between the fingers. Animals avoid asarabacca but fragrance manufacturers use it – primeval and spicy forest smells are in fashion.